Still back home visiting but I crafted this entry before leaving when I realized the only “essential” I’ve mentioned is truffle salt. If you’ve read any of Anthony Bourdain’s books you know he is a big proponent of demi-glace. Traditionally it’s made with veal stock and sauce espagnole and reduced. Making some can be a long process for the home cook. Thankfully there are people who make it and sell it. 10 years ago you probably wouldn’t have been able to find it in stores. I used to order it online and hoard small tubs in my freezer, saving it for special occasions. 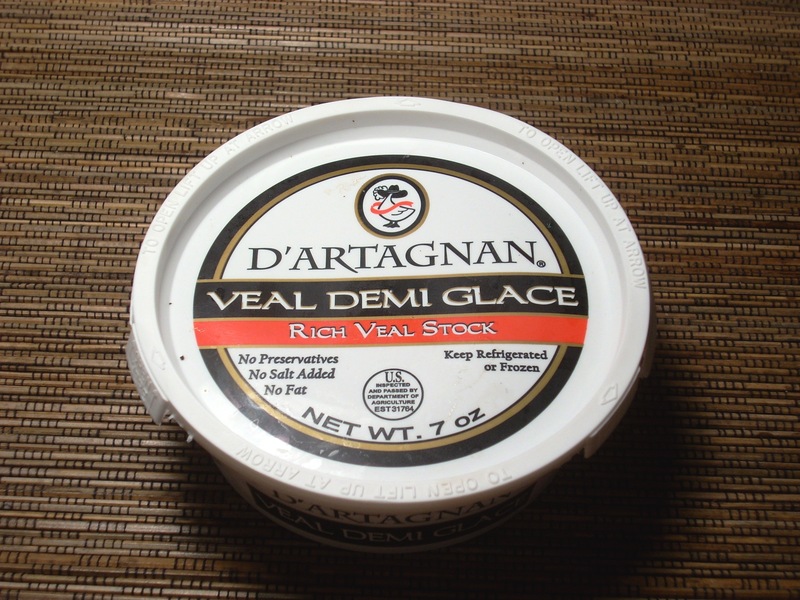 These days it’s not uncommon to find demi-glace in the grocery store and it’s not terribly expensive either. Around $5 depending on your market. Here in Chicago I’ve found it at Treasure Island (they also have my other favorite ingredient, truffle salt). I always try to keep a small package of demi-glace in my freezer. When I need some I just scoop out a spoonful and add it to my sauces. By adding water to it you can use demi-glace to make some quick cup or two of stock when needed for a recipe. I don’t use it as much as the truffle salt but I’m glad to have it on hand, especially from Thanksgiving through New Year’s. With all the roasting and braising I do around this time of year it adds a lot of flavor to the gravies and sauces. Next time you’re in the store ask if they’ve got some and give it a try this Christmas. You won’t be disapponted! Excellent blog – and such a surprise that it’s not by a professional chef, but a pro-am so to speak.. can you do a post on wine pairing?? Thank you! You know, I should try to do that more, I know our wine rack is usually full. I think I did make one with a wine pairing about a year ago by chance. Lasagna I believe, with a chianti.